When it comes to first class sailing holidays in Turkey, for ones that surpass the 5 star hotel standards, one must look further than just a sailing yacht. All VIP Turkish yachts sail. Some of these high end yachts can also be referred to as gullets. Although gulets hold their own standards, there are those that exceed these standards in the quality level of construction, design, layout, facilities and services. Hence the evolution of Turkish gulets turn into the ultimate sailing yachts of the Eastern Mediterranean sea – offering dream vacations which cruise along the pristine waters of both the Mediterranean, as well as the Aegean seas. 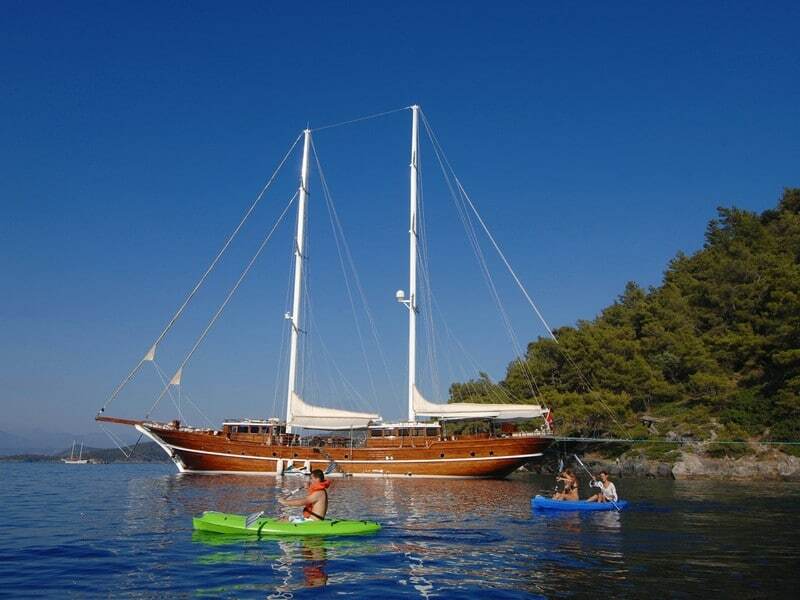 Within the globe of yacht charter in Turkey, sailing gulet charters which are among the top rated Mediterranean exclusives for luxurious blue cruises are known, mainly by the brand they possess in their names. The brands in these premium yacht charters have been acquired through time. Travelers have gotten to know these unique yachts from the experiences either from the guests who have sailed on board or from the references they have given. Possessing one of the most recognized names in gulet tourism is the distinguished Mare Nostrum gulet. She begins the creation of your dream from the moment you step on board – and is one of those dreams that you just do not wish to wake up from. The sailing yacht Mare Nostrum is a true gulet, emphasizing pure traditional design, yet offering all the comforts and facilities of modern day, to compose the best sailing holidays from Turkey’s exceptional shores. 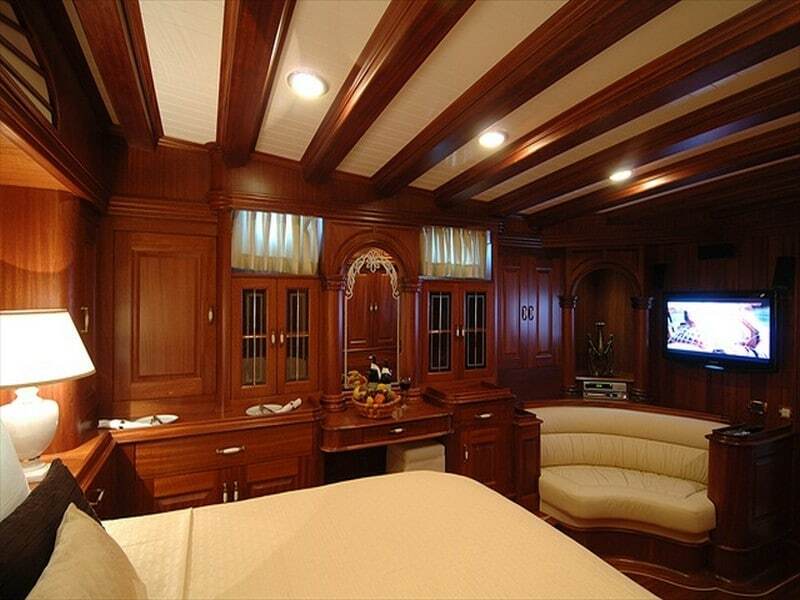 Choose from any one of her 5 well designed double staterooms and 1 twin cabin. Each offer en suites, plasma TVs and air conditioning, as well as bath products for guests’ private use. During your dreamy sea holidays, the aft dining with International cuisine presents a blissful time while gathered at the table for the tastes of savory dishes prepared by the experienced chef on board. There is also a wide bar area for cocktails in the evening and tea time during the day with a flat screen TV. A splendid time can be spent on the cabin top where you will find wide spread cushions that go well with refreshing drinks and pure sun bathing pleasures. As a part of a fleet based in the colorful city of Marmaris; namely the Nurten A gulet and the Kadir Kaptan gulet – the Mare Nostrum completes the trio – perfectly. She is an overwhelming 42 meters in length with a wide beam offering a very stable cruising or sailing experience. Are there any other high standard premium Turkish sailing yachts available? Yes there are many more yacht charters to choose from. Renown in first class luxury, excellent services and accommodation, and of course the highly skilled crew members – whom each have been trained and educated to provide guests premium dream charter holidays in the turquoise waters of Southern Turkey. Our VIP section provides a very good selection of additional yachts to charter from any one of the major harbors such as Bodrum, Marmaris, Gocek and Fethiye.